Incoming: hot, hot new music. We haven’t heard a track like this in a long time. Have you ever wondered what it might sound like if you merged a reggae song with pop and EDM beats? Wonder no more, because this kind of mash-up actually exists. Dutch-Canadian EDM DJ Eva Shaw has collaborated with reggae star Shaggy and dancehall recording artist Demarco to produce ‘High’, a unique and instantly lovable track that’s definitely going to be a club floor favorite. Nightclubs not your thang? 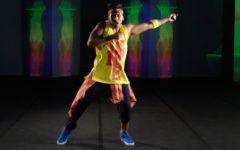 Head to a Zumba® class and try out this choreography for ‘High’, taught by Zumba Jammer Manthony Gerald Tay. We guarantee it’ll leave you feeling anything but low.